Yin and Yang are always linked with the Tai Chi and the early five elements (1/6 water, 2/7 fire, 3/8 wood, 4/9 metal and 5/0 earth), the 64 positions of the lo pan (Feng Shui compass), the magic square, both the early sequence and the late sequence ba gua, the 4 seasons, the 24 chi’s, the 28 mansions, strong and weak, male and female. Sing Chi relates to the location of the house. It is the energy that comes from the soil underneath the house into the building. This is the yin chi. The house absorbs this energy. The lap chi, or sang chi, is the yang chi outside the building. The essence of Feng Shui is bringing the yin and the yang together to create productivity. Similarly, without the union of the male and female, there will be no future generations. Sow San – if you see a good mountain, use it to your advantage. Sow Shui – if you see a good river, use it to your advantage. Chut Sat – if you see an ugly or bad river or mountain, try to reduce its negative effect. However, recognising a good mountain or river is part of the skill of a Feng Shui practitioner, as the definitions are not always obvious. San means mountain. Mountains control peoples’ lives. Shui means water, which relates to money. This is the essence of Feng Shui. Nowadays, fewer people live really close to mountains and rivers, as they did when people were settling in uninhabited lands. So, it is important to note that the principle that relates to mountains and rivers is equally valid for buildings (mountains) and roads (rivers). Yang Feng Shui is associated with houses. It always causes a gathering together to form villages, towns and cities. In past times, this was shown by people choosing to settle together, rather than in isolated positions. Historically, graveyards used to be situated at the edge of a town or city, in rural surroundings. However, with the shortage of space, this is no longer the case. This means that the yin Feng Shui of the graveyard is located with the yang environment of the town. 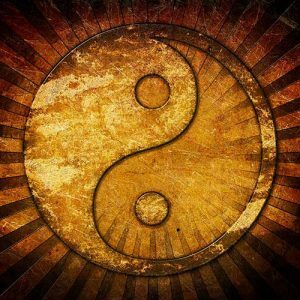 In this case, the yin Feng Shui relates to past and hereditary matters, whereas the yang Feng Shui relates to the present. In the past, people looked for a nice environment with mountains and a river, before they built a house. This was especially true for capital cities, which were always situated in good environments. The same can be said for other cities but was less relevant. This goes down the scale, so that towns and villages had Feng Shui that is not as good as a capital city. However, if a town or village did have good Feng Shui it would thrive. If it did not have good Feng Shui, then people would not stay there and eventually it would disappear. Yang Feng Shui, which relates to the human body and to houses, should be big enough to allow people to live comfortably. Whereas yin Feng Shui, which relates to graves, should not be too big for the purpose.